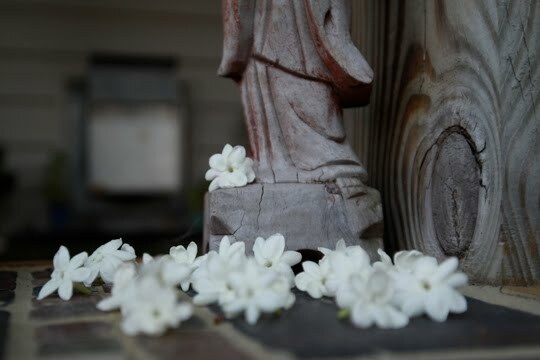 Jasmine blossoms at the feet of Kuan Yin. The blossoms drop from the jasmine towards the middle of the day, so there were a these beautiful little flowers laying on the deck. Their scent and beauty warranted something more than a trash can. And Kuan Yin is the Buddhist Bodhisattva of Compassion. Or at least that's one description. 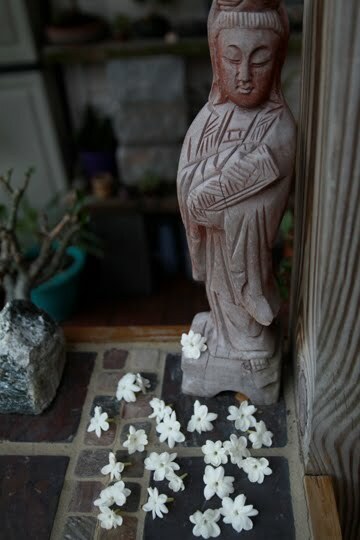 I think she also might be a Chinese goddess. Either way it just seems so appropriate to lay these as an offering to her.